We were in Montana a few weeks ago for a Wilderness Medicine conference for me and skiing for everyone else. I skied, too, but since the optional workshops at the conference are so cool, I didn't want to miss them and so I didn't ski as much once it started. But the skiing was wonderful, and the workshops educational. The highlight was when we simulated a hotel fire and climbed out of a hotel window, with smoke and everything and stood up to see... the pool. With my husband and the kids in it. Saying, "Hi, Mommy! What are you doing here?" Anyhow, one of the things that happened when we were there was we had an amazing dinner at a fondue restaurant. It was a themed thing, with an emcee dressed in lederhosen. Each of the 6 tables was a team and we basically had to amuse the emcee for points. It was rowdy and loud and amazingly fun! In between shouting out things and singing and even getting up for acrobatic tricks, we ate cheese, oil and chocolate fondues. 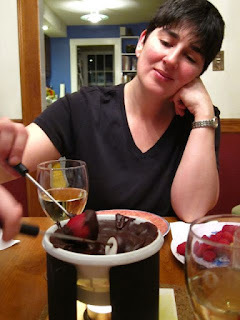 I was reminded how much we love fondue and resolved to make it when I got home. Which I did. Two nights ago. For the cheese fondue, I made a roux with a tablespoon of butter and a tablespoon of flour. Then I added 1 cup of boiling white wine. Once that thickened I added 8 oz. cheddar, and similar amounts of gruyere and emmentaler. Then I stirred and stirred and stirred and stirred until the cheese was melted and the fondue was thick. I left it on the stove, over very low heat, and stirred it occasionally to keep it smooth, while I made the chocolate fondue and get everything ready. Believe it or not, I had a fondue pot. My aunt gave us all fondue pots one year for Christmas, and I tucked mine away. I remembered I had it about a month ago, so found it again and it was perfect! Thanks, Auntie! 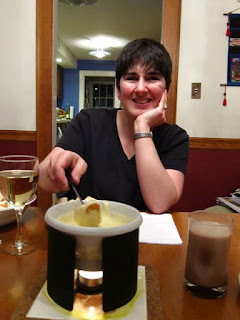 With the cheese fondue we ate bread, chicken nuggets, and steamed broccoli florets. With the chocolate fondue we had strawberries, raspberries, marshmallows and 'Nilla wafers. It was amazingly good! What I remember says was "oh, hello... are you here for our snowball throwing amusement?". Swimming while surrounded by snow drifts is a whole different kind of fun. It seems I have used the word "amazing" a lot in this blog entry. Sorry. I will get a thesaurus and find some other adjectives.